Scholz Garden. Courtesy of the Austin History Center and Austin Public Library. Image available on the Internet and included in accordance with Title 17 U.S.C. Section 107. SCHOLZ GARTEN. Known over the years as Scholz Garden, Scholz’s Garden, Sholz’s Hall, and frequently referred to simply as Scholz’s, Scholz Garten is the oldest continuously operating tavern in Texas. German immigrant August Scholz purchased the property at 1607 San Jacinto Boulevard in 1862 and operated a boarding house on the site. It is unknown whether he operated a tavern as part of the business at this time. A bookbinder by trade, Scholz operated Buaas Hall on what is now 6th Street prior to opening his own establishment. He opened his new saloon and beer garden on August 1, 1866, and called it Scholz Garden. August Scholz (1885). Image available on the Internet and included in accordance with Title 17 U.S.C. Section 107. Scholz’s business thrived as a center of German immigrant culture in Austin and benefitted from Austin’s rapid growth in the 1870s. With the arrival of the Houston and Texas Central Railway in 1871, Austin became a commercial hub, and the population more than doubled between 1870 and 1875. German merchants, professionals, and skilled laborers were drawn to the new opportunities in the city, with German-born residents making up more than 7 percent of the population in 1875. Along with Turner Hall and several other beer gardens, Scholz’s beer garden was an important cultural institution for the growing German population of Austin. Scholz also catered to the Anglo population of the city, and frequently advertised in both English and German-language newspapers. Scholz continued to take boarders for some time after opening Scholz Garden. From its opening until the early twentieth century, Scholz Garten served as one of the centers of popular entertainment in Austin. Its Sunday concerts grew out of the German “continental Sunday” tradition of convivial beer drinking and musical entertainment, but became sources of recreation that were locally advertised and attended by the general public. By the 1880s concerts were offered every Sunday in the summer. A typical Sunday concert on June 26, 1887, featured George Herzog’s Orchestra performing a variety of orchestral, operatic, and dance pieces from European composers such as Giuseppe Verdi and Émile Waldteufel, as well as selections from Gilbert and Sullivan’s The Mikado. Concert goers could also enjoy fireworks, a menagerie, a spring and fountain, hot-air balloon rides, and other amusements. New street car lines provided easy transportation to and from the beer garden. August Scholz’s son-in-law, Carl William Besserer, was a prominent Austin musician and was involved in both the Austin Saengerrunde, a German singing society, and the Austin Symphony Orchestra. Scholz’s hosted meetings, rehearsals, and concerts for both organizations. Until the organization’s demise, the business also served as headquarters for the Austin Germania Society, a social club for ethnic Germans. In addition to the saloon and beer garden, the grounds included a meeting hall and a ninepin bowling alley. Scholz Beer Garten Staff (circa 1920). Courtesy of the Austin History Center and the Portal to Texas History. Image available on the Internet and included in accordance with Title 17 U.S.C. Section 107. In 1885 Besserer and Hermann Lueschow took over the management of Scholz Garten. August Scholz, affectionately known as “Papa Scholz,” died in 1891, and ownership of the business passed to his stepson Theodor Reisner. In 1893 the business was sold to the Lemp Brewing Company of St. Louis. 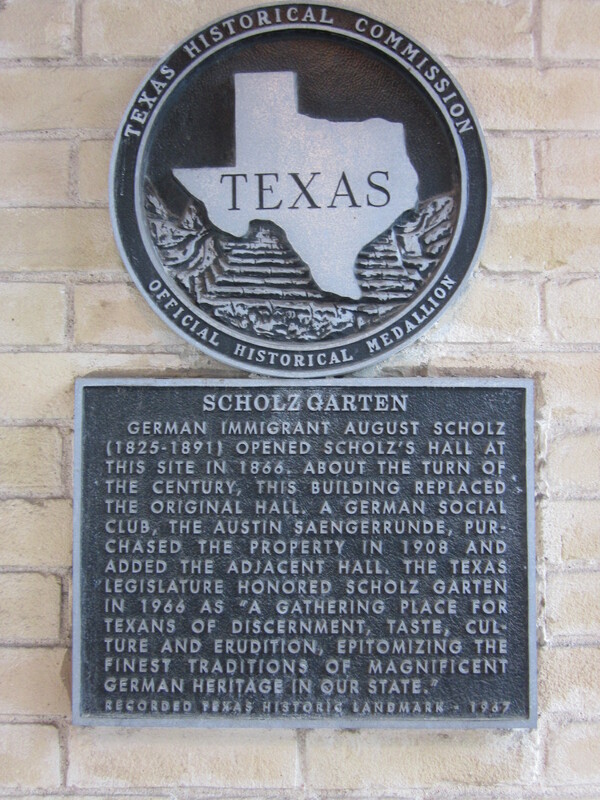 In 1901 Scholz Garten became the exclusive meeting place of the Austin Saengerrunde, the last surviving German singing club in the city. The club leased the property beginning in 1904, and in 1908 they purchased it and tore down the old meeting hall on the south side of the property and erected a new hall that remains today. The current bowling alley was also built by the Saengerrunde after their purchase of the property. Scholz Garten survived the Prohibition years as a result of its ownership by the Austin Saengerrunde, which continued to persevere through the difficult period of anti-German sentiment between the First and Second World Wars. Non-alcoholic “Bone Dry Beer” was sold on the premises and food sales grew in importance. Between 1927 and 1937 Scholz’s does not appear in the Austin city directory, and public access may have been somewhat restricted during this time. In 1937 the Saengerrunde reportedly made plans to reopen the beer garden to the public. Scholz Garten (1965). Courtesy of the Austin History Center and the Portal to Texas History. Image available on the Internet and included in accordance with Title 17 U.S.C. Section 107. Scholz Garden Advertisement (1990). Image available on the Internet and included in accordance with Title 17 U.S.C. Section 107. Scholz Garden in Austin. Image available on the Internet and included in accordance with Title 17 U.S.C. Section 107. Beginning in 1962, the saloon and beer garden was leased to a series of proprietors. The first was Bob Bales, who undertook a series of renovations that included expanding a rear dining room and installing air conditioning, an innovation that sparked a minor rebellion from traditionalists. Bales also changed the spelling to the present “Garten.” A small fire damaged the north end of the building in 1971, and further renovations took place in 1973. Bales operated the business until 1973, when his nephew Larry Bales, a state legislator and assistant attorney general, took over. Bales’s tenure at Scholz’s was characterized by one writer as a period of “benign neglect.” In January 1987 a trio of Austin investors—Michael Osborne, Phil Vitek, and Eddie Wilson—took over the Scholz Garten lease. Vitek was the founder of the Texas Chili Parlor, and Wilson had co-founded the Armadillo World Headquarters and Threadgill’s restaurant. The partners spent $500,000 on renovations and made extensive changes to the menu and entertainment offerings. Despite their restaurant experience, the trio’s efforts were unsuccessful at Scholz Garten, and they filed for bankruptcy in September 1988. After they failed to renew their lease in February 1989, Larry Bales again took over the lease and ran the business until his death in 1994. His children David and Stacy Bales operated Scholz Garten until 1996, when the Saengerrunde signed a lease with local restaurateur Tom Davis. Davis continued to operate Scholz Garten in 2016. Scholz Garten Historical Marker. Image available on the Internet and included in accordance with Title 17 U.S.C. Section 107. Scholz’s has been host to a virtual who’s who of significant figures in Austin history. According to tradition, Austin city marshall and famous gunfighter Ben Thompson reportedly celebrated his acquittal in a San Antonio murder trial at Scholz’s in 1883. Father P. J. Hurth, president of what was then St. Edwards College, was appointed Bishop of India by the Pope in 1894. A dinner in his honor was held at Scholz’s prior to his departure. Governor Oscar B. Colquitt, an opponent of prohibition and friend of the Texas German community, is said to have frequented Scholz’s, a tradition followed by many other governors and legislators. Lady Bird Johnson was a member of the Bored Martyrs society, a University of Texas women’s social club that held monthly meetings at Scholz Garten. Scholz Garten’s close proximity to the state capitol and to the University of Texas has played a key role in its development over the years. The University of Texas football team is believed to have celebrated its first undefeated season at the beer garden in 1893, and professors and students have frequented the establishment since the university’s founding. The University of Texas even considered purchasing the property in 1968 amid fears that the Brackenridge Urban Renewal Project taking place in the area surrounding the business would lead to its demise. Scholz Garten remains a popular location for fans attending Texas Longhorn athletic events. Throughout its history Scholz’s has also been a meeting place for legislators and politicians and has hosted numerous political rallies and fundraisers. Larry Bales stated that he co-drafted the state legislative ethics law, passed in the wake of the Sharpstown stock-fraud scandal, under the trees of the Scholz beer garden. Writers have also frequented Scholz Garten through the years and included it in their works. William Sidney Porter advertised the business in his short-lived weekly, the Rolling Stone. Billy Lee Brammer’s novel on Texas politics, The Gay Place (1962), makes a thinly-veiled reference to the iconic site of political intrigue as the “Dearly Beloved Beer and Garden Party.” Willie Morris wrote about it in North Toward Home (1967). Author and political reporter Winston Bode held an autograph party at Scholz’s after the publication of his biography J. Frank Dobie: A Portrait of Pancho, in 1965. Interior of Scholz Garden. Image available on the Internet and included in accordance with Title 17 U.S.C. Section 107. 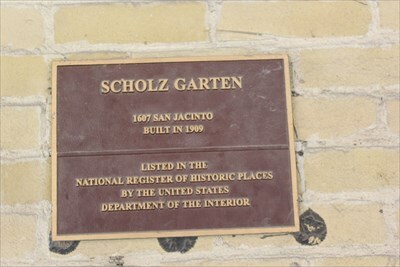 Scholz Garten National Register of Historic Places Marker. Image available on the Internet and included in accordance with Title 17 U.S.C. Section 107. In 1966 Scholz Garten was honored on its centennial by the state legislature, which described the establishment in House Resolution No. 68 as “a gathering place for Texans of discernment, taste, culture [and] erudition” and stated that Scholz Garten epitomized the “finest traditions of magnificent German heritage in our state.” Scholz Garten received a state historical marker in 1967, received historic zoning status in 1975, and was placed on the National Register of Historic Places in 1979. Scholz Garten continues to be a popular meeting place, restaurant, bar, and source of entertainment for Austinites. Concerts, SXSW events, German-themed festivals, political rallies, and University of Texas athletics pre- and post-game festivities all take place on the premises in a typical year. BIBLIOGRAPHY: Austin Chronicle, January 26, 2001. Austin American-Statesman, September 1, 1975; February 9, 11, 14, 1989; March 9, 1996; May 31, 1996. Austin Daily Statesman, May 31, 1967. Austin Statesman, December 8, 1908; March 21, 1937. Historical Marker Files, Texas Historical Commission, Austin. Joe Nick Patoski, “Brew Ha Ha,” Texas Monthly, April 1989. Vertical Files, Austin History Center. Handbook of Texas Online, Nick Roland, "SCHOLZ GARTEN," accessed April 21, 2019, http://www.tshaonline.org/handbook/online/articles/xds12. Uploaded on July 14, 2016. Modified on April 13, 2017. Published by the Texas State Historical Association.